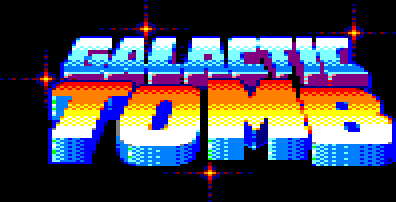 On April 28, 2018, coinciding with RetroMadrid, ESP Soft publishes Galactic Tomb for Amstrad CPC. 2018 is being a good year. Where can we download or purchase it from? SymbOS is the only OS on CPC! Rulez! Wow! A really nice game! It's exactly what the Turrican series should have been on CPC! Where can we download it? Had a quick play, seems well made, would like some feedback when hitting an enemy to show that its doing damage, the bullets just disappear into the enemy other than that no other comments yet. Will this work on the GX4000??? Great game! I have enjoyed it a lot during the evening and I think I will definitely be able to finish it at some point. The music and graphics are awesome and I find the difficulty very well balanced, at least for me. I really love it! Thanks for this great little game. I've just completed it in winape, I couldn't read the end screens, I had fun all the same. Any chance of a version in English too? I've got poke address for all three levels if it's ok to share them. These are for @XeNoMoRPH and @SuTeKH/Epyteor and anyone else that need or want them. "How do I use those pokes?" Use a multiface 2 on real hardware, or add them in a emulator like winape, ignore the 3D that is what is at each address at the moment, they need changing to 00. I thought as much, but thought I'd post to make sure. Here is another option, the poke's can be added directly to the disk, I've made myself a couple of versions that are poked. Use a Hexeditor and open the disk, I use " HxD - Hexeditor ". I hope this helps a few people out. Pretty good game! Cool music, beautiful graphics, and for once, a Spanish game than is not too hard . Though I got killed by the first boss... The scrolling is also quite fast, the character reacts well to the keyboard. Well done! I noticed on the main page there is a cassette cover you can download and instructions on how to load a cassette but no CDT file, will there be one? Page created in 0.223 seconds with 112 queries.